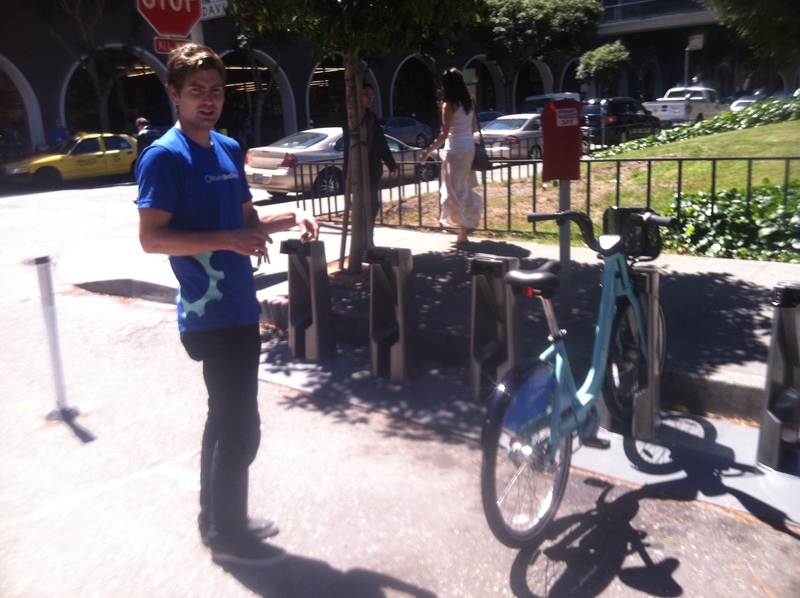 The first bike arrives at the bike share station. Of course Matt rides to work already, but riding a big cargo bike around the Financial District is not always the most convenient option, especially since one time that he did that, his (U-locked) bike was stolen. At noon. In a location with lots of foot traffic. By a thief using a handheld angle grinder. At work, we can bring our bikes inside. Personally, if I had the option, I’d leave my bike inside all day and ride a bike share bike to meetings when I needed to leave the office. I think a docking station is designed to lock up a bike better than I ever could, and I suspect that it would be too tough to sell a bike share bike to make stealing one tempting. Not that it matters, because stolen bike share bikes wouldn’t really be my problem anyway. Although I am not in the neighborhood and I can’t haul my kids on a bike share bicycle, I will eventually make it over to that part of the city (which is flat!) and try one out. You’ll hear about it here first. However the grand opening of bike share is not the only reason that this will be a great weekend. This is also the long weekend of the empty city. On Wednesday night, the Bay Bridge was closed so that Cal Trans can transition the earthquake-damaged eastern span over to the new bridge. Virtually all of the traffic from the East Bay has evaporated. I noticed even this morning that there were far fewer cars on the road, which is always welcome. We have had this experience before during bridge closures, as well as on Thanksgiving and Christmas—visitors leave the city, and everything is suddenly completely accessible to those of us who live here. Restaurant reservations are available all evening and the lines at museums disappear. I’m sure that it’s not great for business, but it’s sometimes nice to have the city be a place just for its residents. Happy Labor Day! Chicago’s bike share has taken off pretty well since it was launched earlier this summer… I got to try ours and I think they are awesome, they roll down the road like light blue tanks and are geared really nicely. However, I think they’d be PERFECT if I could hook up a trailer to the back. My kids still sort of fit in a Burley, so it would be pretty cool to be able to hook them up and go.